Welcome to all current and future readers! 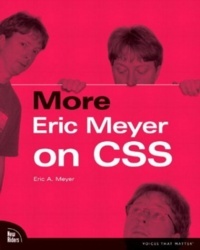 This site serves as a companion to the book More Eric Meyer on CSS , now available from New Riders Publishing. Here you can find the project files to accompany each of the 10 projects in the book. Even if you don't own the book, you can certainly look at any of these materials, as well as read about the book and its author, sample some praise for the book and links to full reviews, and find out where to order a copy of your own. A note to those concerned about the color: although it appears to be a darkish, eye-popping pink on many computers, the book's cover is in fact a vibrant red. It's fairly startling, actually.